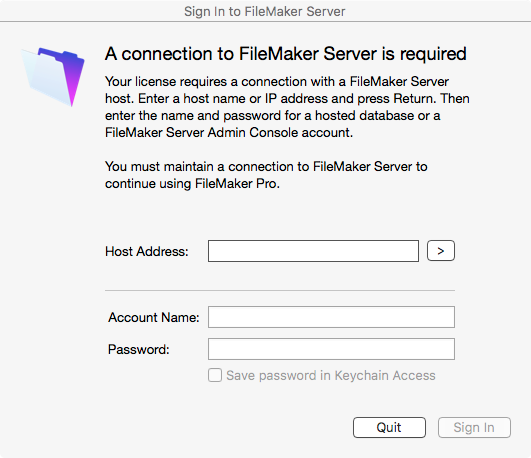 For this discussion, we are specifically interested in how this change bears on the FileMaker Pro client using this new licensing model. When first launched, you can open hosted or local files, create a new files, or any other action, with no limitations. For the Account Name and Password fields, any set of credentials valid on any file hosted on the server will be sufficient. If you lose your connection to the server, you’ll have another 15 minutes or so before you’ll be prompted again for valid server credentials.